Can you survive The Day After Ragnarok? Cover art for The Day After Ragnarok. Credit: Atomic Overmind Press. In the waning days of World War II, the Nazis awoke the world-strangling Midgard serpent, nearly triggering the Norse end of days known as Ragnarok. Their plan was foiled by the Americans, who flew an atomic- bomb-laden aircraft into the Serpent’s miles-wide eye, slaying it in blinding flash of nuclear fire. The wyrm died, its corpse crushing Europe and Great Britain under its weight and its head coming to rest on Egypt. Tidal waves, tainted by the irradiated, venom-laced ichors of the Serpent, drowned the eastern seaboards of North America and South America. 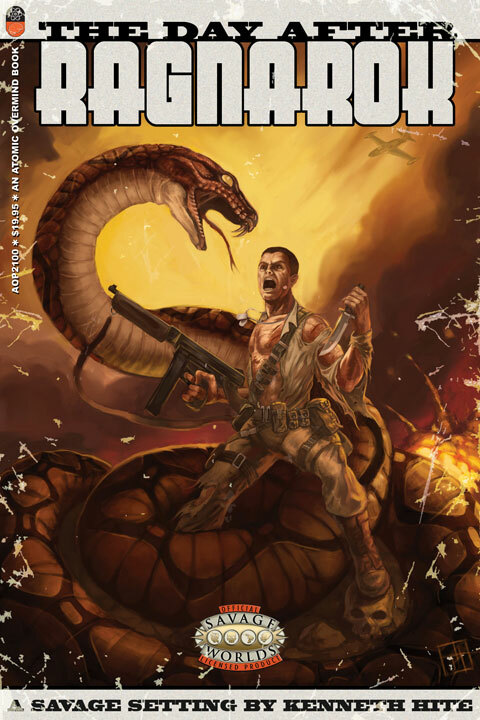 In the aftermath, heroes and villains worthy of Robert E. Howard stalk the wastelands, from Texas Rangers battling the serpentine horrors of the American West to RAAF rocket troopers battling against Soviet super soldiers. This is the setting of The Day After Ragnarok, a campaign setting for Savage Worlds written by Kenneth Hite and published by Atomic Overmind Press. It’s also the pitch I happened to overhear while browsing the Studio 2 booth at Origins 2009, and it’s what got me to buy this folio-sized tome almost without looking. But I had to look. The cover depicts a 1960s-style commando, machine gun in one hand, Bowie knife in the other. A gigantic serpent has already looped itself around one of his legs, and is rising up for the strike while the world burns behind them. It’s hell on Earth … but it’s my kind of hell. As a kid, I loved Thundar the Barbarian. The techno-magical setting, ravaged by a world-wide cataclysm so great that it shattered the moon, resonated with me in ways I only truly understood a decade later when I started reading Robert E. Howard, H.P. Lovecraft, Michael Moorcock and Roger Zelazny. Ragnarok took me back to those days. Written as a Savage Setting, the book relies on the Savage Worlds Explorers Edition book for its core rule set and then adds in Ragnarok-specific rules. The “Hero’s Section” kicks things with a brief two-page history of the alternative world, immediately followed by an overview of character concepts that fit the setting, from arcane scholars to oilmen to secret agents. It then gives you everything you need to train and equip these heroes for a world in which insane snake cults worship were-serpent leaders and god-hating giants fight alongside their atheist Soviet allies. Oh, and did I mention that a low-grade war exists between the city-states of Minneapolis and St. Paul? Magic has reawakened in this world, but it doesn’t come cheaply. The “Magic”, “Miracle” and “Psionics” arcane backgrounds cost double what they do in the standard game (they’re effectively worth two edges) which may be too steep a price for some people … but then again, that’s the point. Psionics have an interesting twist in that they’re required to take the Minor Pacifist hindrance; the death of sentient beings unnerves them, and thus, they avoid it when they can. There’s also a new, equally expensive background: Ophi-tech. Ophi-tech is one of the defining aspects of the campaign; its technology based on new understandings gained from researching and exploring the fallen Midgard Serpent. Researchers from the Rhodes University in South Africa (one of the few remaining research institutions left) have actually delved into the miles-wide corpse of the snake and found entire eco systems there. It’s the weird science of Ragnarok, and it does a fantastic job of establishing the feel of the setting. Other new edges include a number of professions, such as Soldier, Mountie, Texas Ranger, Rhodes Scholar and Speleo-Herpetologist. Military characters can take advantage of a rank/advancement system of their own, as well as dedicated military pay. There are several new hindrances. Luddite (minor) is someone who relies on proven older technology rather than its modern variants; Luddite (major) is a person who’s actively rejected technology (and perhaps thinks it helped bring about the end of the world). Snakebit is a hindrance reflecting a character’s exposure to the toxic Midgard serpent venom. The more they use it (or items built from it), the more likely they are to suffer ill effects when confronting its spawn. The minor version causes you to take penalties when fighting such creatures; with the major one you run the risk of succumbing to the serpent’s evil. If snakes are ever roll in combat, you go over to the other side and begin fighting your allies. The rest of the chapter is given over to new gear, including military-grade weapons, an assortment of vehicles, and ophi-tech. Ophi-tech is almost always powered by snake oil drawn from the wyrm’s corpse and refined into a super-powerful fuel or polymer. Applications include macroni guns (which fire microwave bursts that burn opponents), neural stimulators (serpent venom-based enhancers that give you extra actions in a turn), ablative-metabolic suits (made from Midgard snake skin that can rapidly adapt to hostile environments) and the ever-useful jetpack (favored by agents of British Intelligence). Each runs the risk of potentially catastrophic malfunction; that macroni gun looks cool as it fires its brightly-colored microwave bursts, but having one explode in your hand could be catastrophic. All of this is good, but it’s stuff you could have hobbled together when creating your own weird pulp setting for Savage Worlds. The second half of the book – the Gamemaster’s Section — is where Ragnarok earns its keep. It’s also where the kid who got up early to watch Thundar and the man who read Robert E. Howard get together and say … cool. The section kicks off with a gazetteer of the world after Serpentfall, offering short-but-meat descriptions of countries and regions. There’s the world-spanning British Empire, now based out of Australia and dominating that continent, South Africa, and India. The British, rather than the Americans, are the major power opposing the Soviets in this world, and provide all the super-spy trappings a player could want. America is shattered. The Drowned Coast of the eastern seaboard is home to the ruins of New York, Washington D.C. and a dozen other metro areas. It’s a natural hunting ground for treasure seekers. The Mid-West has fallen into a new feudalism dominated by city states (at least where the Reds haven’t seized control and established new collectives). Texas is its own country again; the West, dominated by California, holds together the tattered threads of the federal government. There’s much more though – dero dwelling beneath the world’s mountains, building strange machines and making alliances with surface nations. Nazis taking refuge in Argentina. A resurgent Japan who’s Far Eastern empire never fell. An Egypt that’s been transformed into a mystical wasteland by the crashing of the Midgard serpent head into its heartland. These entries make for great quick reads, but what makes the Game Master’s Section (and ultimately the book) works so well is that it’s been packed with adventure seeds and NPCs. Every other page has an postcard-sized NPC write-up complete with background and statblock. Further, the books riddled with “Savage Lists” like “Top Five Places to Stomp Nazis”, “Top Five Secret Bases” and “Top Five Places to Be Attacked by Pirates”. They offer the sort of world-at-a-glance facts that expand its mythology while at the same time providing fodder for exploring the uncharted areas of the game. The Monster & NPCs section introduces a rogues gallery of soldiers, mercenaries and other assorted scum, as well as new horrors like wendigos, naga, and (of course) intelligent ape super soldiers. The gorillas are a perfect example of what this book rocks; Ken Hite isn’t content to just give you a single gorilla; no, he gives you five subspecies. He can do this (as well as all those great NPC write-ups) because even “high level” Savage Worlds characters can be statted out in a half or page or less. Given any other system, especially a d20 system, this format would never have worked. For Savage Worlds, it’s near-perfect. The book doesn’t support a Plot Point campaign (the usual way of providing story ideas for a Savage Worlds campaign) ; instead it offers four Campaign Skeletons. These include “Wolves Beyond the Border” (about mercenaries traveling from country to country selling their services), “Servants of the Crown” (British agents serving and protecting the Empire), “Phoenix and Sword” (in which the heroes try and carve out a pocket of civilization in the wasteland) and “City of the Emerald Night” (an urban campaign in which heroes need to deal with local threats to law and order). Each Skeleton includes an example campaign summarized using a 10-item bulleted list, as well as advice on threats and challenges the heroes might face. Each takes up two pages (if that). It may not seem like much, but any GM worth his salt could easily flesh them out on his own. But he doesn’t to do that, because the book also includes a random adventure generator that will give you the hook, the location, the hero’s goal, the villain and her goal, the henchmen, victim, guest star and obstacles – in short, everything you need to create an adventure. If you’re the kind of gamer who loves to sit down lose yourself in a few dozen lists and charts while story ideas bubble through your brain, then this game is for you. My only real complaint about the book is that I want more: more detail about the surviving nations and city states, more insights into the bizarre wyrmscape inside the fallen serpent and yeah, throw in a full-blown Plot Point campaign while you’re at it. What we get works, but it’s the same way the old Greyhawk folio work: it’s a taste of the larger world of Ragnorak; I’m left wanting a full meal. Want more? Check out Nuketown’s Week After Ragnarok feature.